Danny began his stand up career in 1998. A year later he won The Daily Telegraph Open Mic Award, the biggest national competition in the UK for new comics. In 2001, Danny debuted his first solo show at the Edinburgh Festival to audience enrapture and critical acclaim. 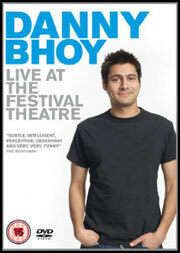 Since then, he has continued to build on his stand up success in the UK, with 10 return visits to the Edinburgh Fringe. In 2014, his show ’12 Nights 12 Charities’ raised £75,000 for local Edinburgh charities. This was followed up with his biggest UK Tour to date throughout 2014/2015. But, his success at home tells only a small part of the story. Since his first visit abroad to the Melbourne Comedy Festival in 2003, Danny has become one of the most globally successful and prolific comics working in the world today. He has built up a massive following in Australia, New Zealand and Canada, where he regularly tours record-breaking shows. As probably the most travelled comedian working in the world today, Danny’s unique brand of story-telling and razor sharp wit has been described as “effortlessly funny”, and “the stand up equivalent of Bill Bryson”.